The Last Black Unicorn (Hardcover) | Fountain Bookstore, Inc.
"I can't get enough of Tiffany. Whatever God gave her in the energy department needs to be bottled up and sold so everybody can instantly feel good. Once you hear her story and her approach to life you literally feel like you can do anything." "Tiffany Haddish is a force as a comedian. My girl demands to be heard and respected. I love you girl! Congratulations on all your success and continue to strive for greatness. You can do it!" "As raw and real as her stand-up act." "[A] harrowing and unforgettable memoir." "This inspiring memoir will have you crying, laughing and wishing she was your BFF." "The book is, no surprise, every bit as rowdy as the movie." "It’s 100% in her voice and feels like her telling you these stories, many heartbreaking, at a bar." "A bawdy, laugh-out-loud tell-all with a liberal dose of heart." "Tiffany Haddish has become known for her unabashed honesty, and continues to keep it 100 in new memoir, The Last Black Unicorn." "The Last Black Unicorn is an entertaining and engaging, must-read page-turner." 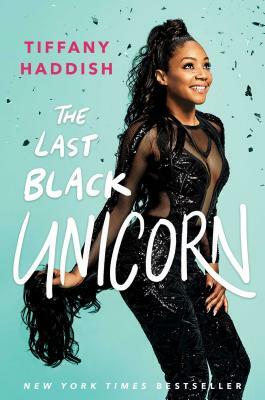 "Haddish is a hilarious, badass, and magical woman, and her memoir, The Last Black Unicorn, is further proof of it. This book will have you ugly-crying with laughter as the actress delves deep into the (very) intimate details of her personal life, using the same incredible sense of humor and fierce, unflinching honesty that won our hearts in the first place." "We love a good story of overcoming adversity and Tiffany Haddish is a true testament of that sentiment." "Readers will love discovering how Tiffany turned her passion for comedy into a full-time career." "Each story is told like a good joke with a solid setup and punchline." "Haddish is an author that demands to be heard and respected, but she never has to work hard to do that and more. If you liked Yes, Please by Amy Poehler or Bossypants by Tina Fey, this is right up your alley." "Actress Tiffany Haddish truly is a unicorn. Fierce, funny, and full of heart, this extremely personal essay collection should not be missed." "The Last Black Unicorn is a hilarious and observant collection of personal essays, filled with truly jaw-dropping twists and turns on Haddish's road to breakout stardom." "A joyful read in which her charismatic voice comes through even if you don’t listen to the audiobook."